our expertise second to none. No one knows gearboxes better than we do. And no one can help you get a broken gearbox back up and running faster than QRS. Every aspect our operation is designed to achieve that end – from our fully-equipped, 150,000 square foot facility and highly skilled technicians backed by computer-assisted engineering to our comprehensive testing procedures that enable us to pinpoint problems quickly and efficiently. 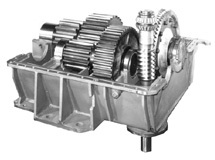 When existing gears and other components in your gear box or drive are damaged beyond repair, QRS will offer you the option of using either OEM replacements, when available, or custom machined or fabricated parts, including casings. In either case, you’ll be assured of both superior quality and rapid turnaround for any replacement components required, all performed in-house. Plus, we’ll keep you informed every step of the way as your unit is repaired or rebuilt. For more information, call Patrick McKernin at 708-354-8080 or email him at patrick.mckernin@qualityreducer.com. Our fully-equipped, 150,000 sf facility is strategically located just 7 miles west of downtown Chicago and within minutes of several major expressways.